In last week's Science, there was a reply by Tony Frudakis, from DNAPrint Genomics, to a paper written by Bolnick et al. a few months back. Basically, Bolnick et al. say that the tests are imperfect and misleading, and the response by Tony Frudakis is that they have thoroughly quantified how imperfect the test is and present this information to customers. Their website does indeed discuss and deal with many of these issues. Bolnick et al. then respond to Frudakis' reply. It is also U.S.-biased because it represents a specifically American racial understanding of human difference. also from Bolnick, this one might be an important consideration, and reflects the problem of AIM allele frequencies in the admixed population changing since initial admixture, although in the Americas, 400 years since admixture is a relatively short time period for this to become a problem, ...maybe? They don't really talk about DNA until the end of the interview. People of African descent, and poorer people have a smaller risk of getting dengue hemorrhagic fever (DHF), according to previous studies. This study uses genetic admixture and measures of income to see how they co-vary with risk of DHF in Brazil. They find that ancestry and income are independently associated with DHF risk. They explain the income finding in two ways: 1) those with a higher income are more likely to be diagnosed, and 2) "exposure to dengue may also differ by socioeconomic level". One last thing. They state that "Income and percent African ancestry were only weakly correlated (r2=0.12) and not collinear." I'm not so sure they've completely established a genetic influence, but I guess now it's time for admixture mapping for genetic variants that contribute to DHF risk, all the while controlling for income. European Journal of Human Genetics Published online 13 February 2008. Abstract: To test whether African ancestry is protective for severe dengue, we genotyped 49 hospitalized cases of dengue hemorrhagic fever (DHF) as well as 293 neighborhood cases of dengue fever and 294 asymptomatic controls in Salvador, Bahia, Brazil. Ancestry-informative markers and 282 unlinked SNPs not associated with the clinical presentation of dengue were used to estimate ancestry. After controlling for income, both self-defined Afro-Brazilian ethnicity and African ancestry were protective for DHF (P=0.02, OR=0.28 and P=0.02, OR=0.13, respectively). Income or an index of income indicators, however, was also independently associated with the diagnosis of DHF. I really liked the idea behind this paper that came out a week or so ago. I did a cursory reading of it back then, since I've been pretty busy lately. Today, I saw this news story in Science Daily covering the paper and it re-sparked my interest. I will have to read it very closely once I get a chance. I wish bloggers had talked more about it, as I think that the implications are really important in the context of understanding ethnic differences in disease risk. It is the second most viewed paper at PLoS Genetics. Please do drop me a comment if you've seen another blog discussing it. UPDATE: I just noticed that Daniel at Genetic Future has a nice write-up of what they did in this paper along with a description of some of the potential problems. Abstract The dispersal of the Austronesian language family from Southeast Asia represents the last major diaspora leading to the peopling of Oceania to the East and the Indian Ocean to the West. Several theories have been proposed to explain the current locations, and the linguistic and cultural diversity of Austronesian populations. However, the existing data do not support unequivocally any given migrational scenario. In the current study, the genetic profile of 15 autosomal STR loci is reported for the first time for two populations from opposite poles of the Austronesian range, Madagascar at the West and Tonga to the East. These collections are also compared to geographically targeted reference populations of Austronesian descent in order to investigate their current relationships and potential source population(s) within Southeast Asia. Our results indicate that while Madagascar derives 66.3% of its genetic makeup from Africa, a clear connection between the East African island and Southeast Asia can be discerned. The data suggest that although geographic location has influenced the phylogenetic relationships between Austronesian populations, a genetic connection that binds them beyond geographical divides is apparent. "The most comprehensive characterization to date of human genetic variation"
These papers just keep on coming out. Razib at GNXP has a link to an NPR interview of Rick Myers, the lead author of this new one in Science. In this paper they look at 600K SNPs in the HGDP (~1000 people from 50 pops). They're calling it "the most comprehensive characterization to date of human genetic variation", which I can't argue with. I haven't looked at the paper yet, but judging from the figure that Razib put up, they probably have a lot of "high resolution" population comparisons, since they type so many SNPs (and pops). Here's a link to the abstract of the paper. ...designing melanocortin analogs that mimic the effects of alpha-MSH as a strategy to prevent skin cancer, particularly in individuals who express MC1R genotypes that reduce but do not abolish MC1R function, or mutations in other melanoma susceptibility genes, such as p16. The Melanocortin 1 Receptor and the UV Response of Human Melanocytes-A Shift in Paradigm. Abdel-Malek ZA, Knittel J, Kadekaro AL, Swope VB, Starner R.
Abstract: Cutaneous pigmentation is the major photoprotective mechanism against the carcinogenic and aging effects of UV. Epidermal melanocytes synthesize the pigment melanin, in the form of eumelanin or pheomelanin. Synthesis of the photoprotective eumelanin by human melanocytes is regulated mainly by the melanocortins alpha-melanocortin (alpha-MSH) and adrenocorticotropic hormone (ACTH), which bind the melanocortin 1 receptor (MC1R) and activate the cAMP pathway that is required for UV-induced tanning. Melanocortins stimulate proliferation and melanogenesis and inhibit UV-induced apoptosis of human melanocytes. Importantly, melanocortins reduce the generation of hydrogen peroxide and enhance repair of DNA photoproducts, independently of pigmentation. MC1R is a major contributor to the diversity of human pigmentation and a melanoma susceptibility gene. Certain allelic variants of this gene, namely R151C, R160W and D294H, are strongly associated with red hair phenotype and increased melanoma susceptibility. Natural expression of two of these variants sensitizes melanocytes to the cytotoxic effect of UV, and increases the burden of DNA damage and oxidative stress. We are designing potent melanocortin analogs that mimic the effects of alpha-MSH as a strategy to prevent skin cancer, particularly in individuals who express MC1R genotypes that reduce but do not abolish MC1R function, or mutations in other melanoma susceptibility genes, such as p16. ... the importance of adaptations for the evolution of European populations needs to be tempered by our finding that negative selection is less effective at removing slightly deleterious alleles from European populations. Second, the idea that bottlenecks and founder effects could lead to an increase in damaging alleles in human populations was historically reserved for isolated populations that experienced severe founder effects (for example Ashkenazi Jews22 and Finns23). the second one uses a combination of 1/2 million SNPs and 396 CNVs to examine patterns of global variation from 29 populations. There's plenty of colorful eye candy figures in this one. I'm busy now so can't look too closely at either of these papers, but I'm intrigued by the finding of more CNVs in Oceania??? they probably have some kind of interpretation in the paper. If you read the paper and understand, please feel free to explain in the comments. Abstract Quantifying the number of deleterious mutations per diploid human genome is of crucial concern to both evolutionary and medical geneticists1, 2, 3. Here we combine genome-wide polymorphism data from PCR-based exon resequencing, comparative genomic data across mammalian species, and protein structure predictions to estimate the number of functionally consequential single-nucleotide polymorphisms (SNPs) carried by each of 15 African American (AA) and 20 European American (EA) individuals. We find that AAs show significantly higher levels of nucleotide heterozygosity than do EAs for all categories of functional SNPs considered, including synonymous, non-synonymous, predicted 'benign', predicted 'possibly damaging' and predicted 'probably damaging' SNPs. This result is wholly consistent with previous work showing higher overall levels of nucleotide variation in African populations than in Europeans4. EA individuals, in contrast, have significantly more genotypes homozygous for the derived allele at synonymous and non-synonymous SNPs and for the damaging allele at 'probably damaging' SNPs than AAs do. For SNPs segregating only in one population or the other, the proportion of non-synonymous SNPs is significantly higher in the EA sample (55.4%) than in the AA sample (47.0%; P lesss than 2.3 10-37). We observe a similar proportional excess of SNPs that are inferred to be 'probably damaging' (15.9% in EA; 12.1% in AA; P less than 3.3 10-11). Using extensive simulations, we show that this excess proportion of segregating damaging alleles in Europeans is probably a consequence of a bottleneck that Europeans experienced at about the time of the migration out of Africa. Abstract Genome-wide patterns of variation across individuals provide a powerful source of data for uncovering the history of migration, range expansion, and adaptation of the human species. However, high-resolution surveys of variation in genotype, haplotype and copy number have generally focused on a small number of population groups1, 2, 3. Here we report the analysis of high-quality genotypes at 525,910 single-nucleotide polymorphisms (SNPs) and 396 copy-number-variable loci in a worldwide sample of 29 populations. Analysis of SNP genotypes yields strongly supported fine-scale inferences about population structure. Increasing linkage disequilibrium is observed with increasing geographic distance from Africa, as expected under a serial founder effect for the out-of-Africa spread of human populations. New approaches for haplotype analysis produce inferences about population structure that complement results based on unphased SNPs. Despite a difference from SNPs in the frequency spectrum of the copy-number variants (CNVs) detected—including a comparatively large number of CNVs in previously unexamined populations from Oceania and the Americas—the global distribution of CNVs largely accords with population structure analyses for SNP data sets of similar size. Our results produce new inferences about inter-population variation, support the utility of CNVs in human population-genetic research, and serve as a genomic resource for human-genetic studies in diverse worldwide populations. Metabolism and climate: a connection in our genes? The presumed flow chart: latitude--climate--energy metabolism--genetic variants. They want to know if variation in the genes involved in metabolic disorders mirrors variation in climate. They look at diversity of SNPs in 82 candidate genes involved in metabolic disorders among 1034 individuals from 54 populations (HGDP panel). Interestingly, many of the variants with latitudinal clines in Drosophila reside in genes involved in energy metabolism. Abstract: Evolutionary pressures due to variation in climate play an important role in shaping phenotypic variation among and within species and have been shown to influence variation in phenotypes such as body shape and size among humans. Genes involved in energy metabolism are likely to be central to heat and cold tolerance. To test the hypothesis that climate shaped variation in metabolism genes in humans, we used a bioinformatics approach based on network theory to select 82 candidate genes for common metabolic disorders. We genotyped 873 tag SNPs in these genes in 54 worldwide populations (including the 52 in the Human Genome Diversity Project panel) and found correlations with climate variables using rank correlation analysis and a newly developed method termed Bayesian geographic analysis. In addition, we genotyped 210 carefully matched control SNPs to provide an empirical null distribution for spatial patterns of allele frequency due to population history alone. For nearly all climate variables, we found an excess of genic SNPs in the tail of the distributions of the test statistics compared to the control SNPs, implying that metabolic genes as a group show signals of spatially varying selection. Among our strongest signals were several SNPs (e.g., LEPR R109K, FABP2 A54T) that had previously been associated with phenotypes directly related to cold tolerance. Since variation in climate may be correlated with other aspects of environmental variation, it is possible that some of the signals that we detected reflect selective pressures other than climate. Nevertheless, our results are consistent with the idea that climate has been an important selective pressure acting on candidate genes for common metabolic disorders. Do you REALLY belong to my ethnic group? In this paper, the authors provide genetic evidence that a Chinese ethnic group called the Pinghua does not cluster as predicted with the Han ethnic group . I was taken aback by the first sentence of the abstract: "The Han Chinese is the largest single ethnic group in the world..." ... hmmm... interesting, not too sure what to make of that kind of claim. with this kind of paper you can start to imagine the potential that these studies have for being fodder for social/biological prejudice or inter-group conflict. On the other hand, it is great to have genetic studies of Chinese populations, and by Chinese researchers..notice that the Genographic consortium is one of the authors. Pinghua population as an exception of Han Chinese's coherent genetic structure. Gan RJ, Pan SL, Mustavich LF, Qin ZD, Cai XY, Qian J, Liu CW, Peng JH, Li SL, Xu JS, Jin L, Li H; The Genographic Consortium. Abstract: The Han Chinese is the largest single ethnic group in the world, consisting of ten Chinese branches. With the exception of the Pinghua branch, the genetic structure of this group has been studied extensively, and Y chromosome and mitochondrial (mt)DNA data have demonstrated a coherent genetic structure of all Han Chinese. It is therefore believed that the Pinghua branch, being members of an old branch of the Han Chinese, despite being scattered in and around Guangxi Province where members of the Daic and Hmong-Mien are more prevalent than Han Chinese, is no exception. We have studied 470 individual samples (including 195 males) from Pinghua populations and other ethnic groups (Zhuang, Kam, Mulam, Laka, and Mien) from six areas (Hezhou, Fuchuan, Luocheng, Jinxiu, Sanjiang, and Wuxuan) in the north of the Guangxi Zhuang Autonomous Region of China. Both mtDNA and the Y chromosomes were typed in these samples. High frequencies of the Y chromosome haplogroups O2a* and O*, which always present at a high frequency among the populations of the southern minorities, were found in Pinghua populations. Only Pinghua populations in Luocheng and Jinxiu maintain the Han frequent haplogroup O3a5a. mtDNA lineages B4a, B5a, M*, F1a, M7b1, and N* were found in Pinghua populations, exhibiting a pattern similar to the neighboring indigenous populations, especially the Daic populations. Cluster analyses (dendrograms, principal component analyses, and networks) of Pinghua populations, the other Han branches, and other ethnic groups in East Asia indicated that Pinghua populations are much closer to the southern minorities than to the other Han branches. Admixture analyses confirmed this result. In conclusion, we argue that Pinghua populations did not descend from Han Chinese, but from southern minorities. The ancestral populations of Pinghua people were assimilated by the Han Chinese in terms of language, culture, and self-identification and, consequently, the Pinghua people became an exceptional branch of Han Chinese's coherent genetic structure. To live long, or to reproduce often: what's a fruitfly to eat? High levels of protein are good for egg-laying rate but not for longevity. When given a choice the flies go for an intermediate protein to carbohydrate ratio that optimizes their lifetime egg production. Abstract Modest dietary restriction (DR) prolongs life in a wide range of organisms, spanning single-celled yeast to mammals. Here, we report the use of recent techniques in nutrition research to quantify the detailed relationship between diet, nutrient intake, lifespan, and reproduction in Drosophila melanogaster. Caloric restriction (CR) was not responsible for extending lifespan in our experimental flies. Response surfaces for lifespan and fecundity were maximized at different protein–carbohydrate intakes, with longevity highest at a protein-to-carbohydrate ratio of 1:16 and egg-laying rate maximized at 1:2. Lifetime egg production, the measure closest to fitness, was maximized at an intermediate P:C ratio of 1:4. Flies offered a choice of complementary foods regulated intake to maximize lifetime egg production. The results indicate a role for both direct costs of reproduction and other deleterious consequences of ingesting high levels of protein. We unite a body of apparently conflicting work within a common framework and provide a platform for studying aging in all organisms. Aggressive breast cancer among African Americans in the Chesapeake Bay...can ancestry in Africa explain this? This new paper in AJHB (abstract below) suggests a framework with which to understand why breast cancer rates in the Chesapeake Bay area are so high compared to the rest of the US, and why they are particularly aggressive among African Americans. They ask: What was the African ancestral source of the African Americans who currently live there, and provide some evidence that it was groups from around the Bight Of Bonny. On a national scale, European American women have a higher incidence of breast cancer than African American women after the age of 35 but African American women have a higher incidence before age 35 and are more likely to die from breast cancer at every age. This disparity is reportedly widening (Jatoi et al., 2005). In the Chesapeake Bay region, comprising Maryland, Virginia, Delaware, and the District of Columbia, (Fig. 1), breast cancer is exceptionally high. Thus, it is hypothesized that the composition of the founding populations, particularly among local African American women in the Chesapeake Bay region, may explain, in part, the Chesapeake Bay foci for this disease pattern. What is special about the Chesapeake Bay with respect to African ethnic groups. local fish and other Bay products", as well as others. We hypothesize that the composition of the founding populations, particularly among local African Americans in the Chesapeake Bay region may play an important role in predisposing many current regional microethnic groups to breast cancer. Ancestral links to the Bight of Bonny may be particularly important in understanding US breast cancer differentials, both between and among African Americans. I think that they make a valiant effort to figure out, or at least think about why, Chesapeake Bay Americans and particularly the African Americans in that area are at such high risk of aggressive breast cancer by relating it to the ancestral composition of the Africans who were brought there. They discuss this at the "microethnic" scale as they call it, discuss the historical evidence, and narrow it down to the Bight of Bonny. It's definitely a hypothesis-generating kind of study, calling for a more detailed genetic examination of African groups. American Journal of Human Biology Volume 20, Issue 2, 2008. Abstract The high frequency of aggressive, early onset, and highly fatal breast cancer among Chesapeake Bay region African Americans suggests that there may be a contributing ancestral component. This study identifies the region's founding African, European, and Native American Indian populations using ethnogenetic layering and identifies the microethnic substructure of each founding continental aggregate. The largest component (38%) of the enslaved Africans brought to the Chesapeake Bay originally came from the coastal and hinterlands of the Bight of Bonny, a region with very high rates of aggressive, early onset breast cancer. Ethnogenetic layering is applied a second time to reveal the microethnic groups of the Bight of Bonny hinterlands with historical links to the Chesapeake Bay region. These analyses identify the specific microethnic groups within this region of Africa that may be the sources of relevant polymorphisms contributing to the etiology of aggressive breast cancer in the Chesapeake Bay. This report suggests a historical link between specific African microethnic groups and a US health disparity. I posted about this gene a while back in reference not only to its' funny name but also to the hypothesized selection pressures that created a north-south gradient in Europe for one of its SNPs (677T - rs1801133), related to its' purported link to folate metabolism, and specifically, pregnancy loss (as well as a bunch of other conditions) due to hyperhomocysteinemia. (Here is the link to that paper). Epidemiological studies found that plasma homocysteine was correlated with LBM (Rauh et al. 2001) and BMI (Jacques et al. 2001). This MTHFR seems to be a gene with far reaching implications! Abstract Along with aging, human body composition undergoes notable changes and may incur sarcopenia, obesity or osteoporosis. Sarcopenia is related to a wide series of human health problems and can be largely characterized by loss of lean body mass (LBM). Studies have showed relevance of methylenetetrahydrofolate reductase (MTHFR) with variation in LBM and fat body mass (FBM). To test if polymorphism of the MTHFR gene is underlying the pathology of sarcopenia and obesity, we concurrently tested five single nucleotide polymorphisms (SNPs) of the MTHFR gene for association with LBM, FBM and body mass index (BMI) in 405 Caucasian nuclear families comprising 1,873 individuals. After correction for multiple testing, we detected significant associations for LBM with rs2066470 (P = 0.0006), rs4846048 (P = 0.0007) and with rs3737964 (P = 0.004), as well as for BMI with rs4846048 (P = 0.009). Polymorphism of rs2066470 explains 3.67% of LBM variation in this sample. The association between BMI and rs4846048 diminished after adjusting for LBM, suggesting that the association between BMI and rs4846048 is largely due to LBM instead of the fat component. In concert, no significant associations were identified for FBM with any of the studied SNPs. The results of single-locus association analyses were corroborated by haplotype-based analyses. In summary, the MTHFR gene polymorphism is associated with LBM, suggesting that MTHFR may play an important role in LBM variation. In addition, the MTHFR gene polymorphism is not associated with FBM or obesity in this sample. The EPR offers a valuable resource for human genomic studies especially when compared to anonymous DNA registries. It was designed for scientists to screen for functionally significant alleles and to identify subpopulations of individuals with shared genotypes, and then correlate their genotypes with their phenotypes in a process known as “recruit-by-genotype.” A unique feature of the EPR is that two distinct populations are solicited, an apparently healthy population recruited from the general population as well as a clinic population recruited from various clinics and hospitals in the area. Individuals in the clinic population have a wide array of medical conditions, and their inclusion in the EPR increases the likelihood of identifying subjects with both the genotypes and phenotypes of interest. These aspects of the EPR give scientists more flexibility in designing follow-up studies while reducing the ascertainment bias that can occur in genetic epidemiology studies when subjects are recruited based on phenotype. In addition, a comprehensive program has been established to maintain contact with EPR participants, to update their personal information and maximize response rates for follow-up studies. They discuss the pretty high enrollment and consent rates - about 75% of people are willing to give their DNA linked to their name - the researchers can go back and get follow up phenotypic data - which is pretty cool. They are giving subjects $20 for their time, which seems to be an ethical issue in itself, but they don't really talk about that. The discussion is pretty interesting since they discuss some of the advantages in having a non-clinic population in examining gene x environment interactions. Abstract The National Institute of Environmental Health Sciences is establishing a DNA repository named the Environmental Polymorphisms Registry (EPR). The goal is to recruit 20,000 subjects from the greater Research Triangle Park region of North Carolina and collect a sample of each subject’s DNA for genetic study. Personal information is obtained from each EPR subject and linked to their sample in coded form. Once individuals with the genotypes of interest are identified, their samples are decoded, and their names and contact information are given to scientists for follow-up studies in which genotype is important. “Recruit-by-genotype” resources such as the EPR require a transparent consent process and rigorous human subjects protection measures. Unlike the EPR, most US DNA resources are anonymous. Once scientists identify potentially significant genetic variants, they must screen new populations to find individuals with the variants of interest to study. The EPR eliminates this time consuming and expensive step. In designing the EPR, consideration was given to achieving high response rates, minimizing attrition and maximizing usefulness for future research studies. Subjects are recruited from outpatient clinics in area medical centers as well as from the general population to ascertain individuals in diverse states of health. Data are collected on race, ethnicity, gender and age, and are monitored for demographic diversity. As of November 2007, 7,788 individuals have been recruited into the EPR and their DNA samples have been used in numerous genetic studies. EPR subjects have also been solicited for several follow-up studies with high response rates (>90%). The success of the EPR based on the number of subjects recruited and genetic studies underway, suggests that it will be a model for future DNA resources. The authors of this new paper (abstract below) look at Fst values for 2.8 milion HapMap SNPs and consider the location and potential physiological impact of the nonsynonymous SNPs that show high Fst values (indicating positive selection). They use a program called Polyphen, that I haven't heard of before, that "predicts the functional effect of impact of an amino acid substitution on the structure and function of a human protein". They publish a list of 582 genes that contain at least one nonsynonymous high Fst SNP in the suppl. material, and list a few of them in the paper. For example, EDAR regulates hair follicle density and the development of sweat glands and teeth in humans and mice[24, 25]. In humans, selective pressures on EDAR favoring changes in body temperature regulation and hair follicle density in response to colder climates may have influenced tooth shape, although this trait probably does not affect population fitness. This anecdotal example shows how 'phenotypic hitchhiking' in genes under positive selection may have substantially increased the observed number of physiological and morphological traits differentiating modern human populations. Another important selective pressure that has confronted modern humans is adaptation to variable nutritional resources. Several genes involved in the regulation of insulin and in metabolic syndrome seem to have undergone positive selection (Table 1). For example, ENPP1 harbors a mutation with a derived state known to protect against obesity and type II diabetes27 that is present in 90% of non-Africans but virtually absent in Africans (rs1044498; FST = 0.77, Supplementary Note). ENPP1 and several other examples of derived protective alleles28 indicate that, in contrast to the situation with mendelian diseases, alleles that increase complex disease risk are not necessarily new mutations, but rather ancestral alleles that have become disadvantageous after changes of environment and lifestyle. Abstract: The considerable range of observed phenotypic variation in human populations may reflect, in part, distinctive processes of natural selection and adaptation to variable environmental conditions. Although recent genome-wide studies have identified candidate regions under selection1, 2, 3, 4, 5, it is not yet clear how natural selection has shaped population differentiation. Here, we have analyzed the degree of population differentiation at 2.8 million Phase II HapMap single-nucleotide polymorphisms6. We find that negative selection has globally reduced population differentiation at amino acid–altering mutations, particularly in disease-related genes. Conversely, positive selection has ensured the regional adaptation of human populations by increasing population differentiation in gene regions, primarily at nonsynonymous and 5'-UTR variants. Our analyses identify a fraction of loci that have contributed, and probably still contribute, to the morphological and disease-related phenotypic diversity of current human populations. Using simulated admixed individuals and populations from the HapMap data, they find that this method outperforms STRUCTURE. I had a hard time understanding the nitty gritty of this new method so I'll just leave it at that. By the way, AJHG is open access for the next few months since they just changed publishers. Abstract: Large-scale genotyping of SNPs has shown a great promise in identifying markers that could be linked to diseases. One of the major obstacles involved in performing these studies is that the underlying population substructure could produce spurious associations. Population substructure can be caused by the presence of two distinct subpopulations or a single pool of admixed individuals. In this work, we focus on the latter, which is significantly harder to detect in practice. New advances in this research direction are expected to play a key role in identifying loci that are different among different populations and are still associated with a disease. We evaluated current methods for inference of population substructure in such cases and show that they might be quite inaccurate even in relatively simple scenarios. We therefore introduce a new method, LAMP (Local Ancestry in adMixed Populations), which infers the ancestry of each individual at every single-nucleotide polymorphism (SNP). LAMP computes the ancestry structure for overlapping windows of contiguous SNPs and combines the results with a majority vote. Our empirical results show that LAMP is significantly more accurate and more efficient than existing methods for inferrring locus-specific ancestries, enabling it to handle large-scale datasets. We further show that LAMP can be used to estimate the individual admixture of each individual. Our experimental evaluation indicates that this extension yields a considerably more accurate estimate of individual admixture than state-of-the-art methods such as STRUCTURE or EIGENSTRAT, which are frequently used for the correction of population stratification in association studies. Nature has picked up and spiffed up Obesity Research and it is now called Obesity. I've been looking at the table of contents, and found a lot of interesting papers on a variety of topics (genetics, socio-economic influences, population differences, measurement techniques) related to obesity. By the way, there was a news story yesterday about a paper in PLoS Medicine that found that the health care costs associated with people who are not obese and live a long time are greater than those for people who are obese... so maybe the conventional wisdom that the obesity epidemic is costing us a lot of health care dollars is not so straightforward. Looks like mtDNA analysis in rats worldwide also "reveals a major Southern Asian chapter in 'their' prehistory" (S. Asian origin, really) according to Kambiz's post at Anthropology.net. Abstract: The relative timing and size of regional human population growth following our expansion from Africa remain unknown. Human mitochondrial DNA (mtDNA) diversity carries a legacy of our population history. Given a set of sequences, we can use coalescent theory to estimate past population size through time and draw inferences about human population history. However, recent work has challenged the validity of using mtDNA diversity to infer species population sizes. Here we use Bayesian coalescent inference methods, together with a global data set of 357 human mtDNA coding-region sequences, to infer human population sizes through time across 8 major geographic regions. Our estimates of relative population sizes show remarkable concordance with the contemporary regional distribution of humans across Africa, Eurasia, and the Americas, indicating that mtDNA diversity is a good predictor of population size in humans. Plots of population size through time show slow growth in sub-Saharan Africa beginning 143–193 kya, followed by a rapid expansion into Eurasia after the emergence of the first non-African mtDNA lineages 50–70 kya. 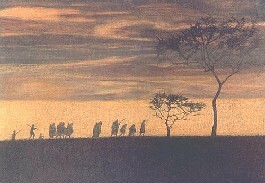 Outside Africa, the earliest and fastest growth is inferred in Southern Asia 52 kya, followed by a succession of growth phases in Northern and Central Asia (49 kya), Australia (48 kya), Europe (42 kya), the Middle East and North Africa (40 kya), New Guinea (39 kya), the Americas (18 kya), and a second expansion in Europe (10–15 kya). 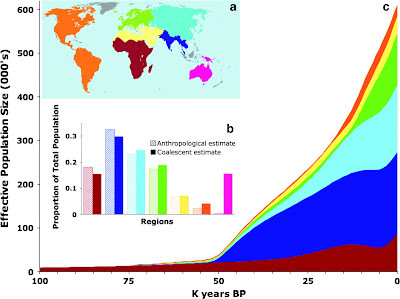 Comparisons of relative regional population sizes through time suggest that between approximately 45 and 20 kya most of humanity lived in Southern Asia. These findings not only support the use of mtDNA data for estimating human population size but also provide a unique picture of human prehistory and demonstrate the importance of Southern Asia to our recent evolutionary past. Rheumatoid arthritis is thought to be more prevalent among individuals of European ancestry. It remains unclear whether these associations are attributable to the HLA-DRB1 alleles per se or to allelic variants in genetic regions in linkage disequilibrium with HLA-DRB1. There are a plethora of genes with immune function in the MHC locus, many of which have been implicated in RA, including HLA-DQA1, HLA-DQB1, tumor necrosis factor, MICB, and BTNL2 ([39-41]). Laura B. Hughes et al. OBJECTIVE: To determine whether shared epitope (SE)-containing HLA-DRB1 alleles are associated with rheumatoid arthritis (RA) in African Americans and whether their presence is associated with higher degrees of global (genome-wide) genetic admixture from the European population. METHODS: In this multicenter cohort study, African Americans with early RA and matched control subjects were analyzed. In addition to measurement of serum anti-cyclic citrullinated peptide (anti-CCP) antibodies and HLA-DRB1 genotyping, a panel of >1,200 ancestry-informative markers was analyzed in patients with RA and control subjects, to estimate the proportion of European ancestry. RESULTS: The frequency of SE-containing HLA-DRB1 alleles was 25.2% in African American patients with RA versus 13.6% in control subjects (P = 0.00005). Of 321 patients with RA, 42.1% had at least 1 SE-containing allele, compared with 25.3% of 166 control subjects (P = 0.0004). The mean estimated percent European ancestry was associated with SE-containing HLA-DRB1 alleles in African Americans, regardless of disease status (RA or control). As reported in RA patients of European ancestry, there was a significant association of the SE with the presence of the anti-CCP antibody: 86 (48.9%) of 176 patients with anti-CCP antibody-positive RA had at least 1 SE allele, compared with 36 (32.7%) of 110 patients with anti-CCP antibody-negative RA (P = 0.01, by chi-square test). CONCLUSION: HLA-DRB1 alleles containing the SE are strongly associated with susceptibility to RA in African Americans. The absolute contribution is less than that reported in RA among populations of European ancestry, in which approximately 50-70% of patients have at least 1 SE allele. As in Europeans with RA, the SE association was strongest in the subset of African American patients with anti-CCP antibodies. 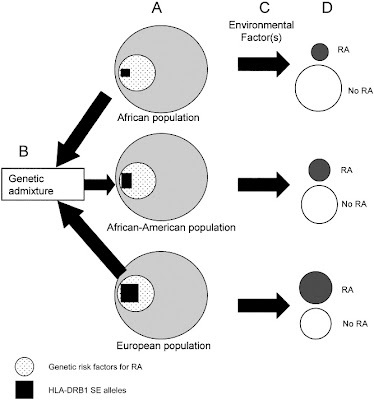 The finding of a higher degree of European ancestry among African Americans with SE alleles suggests that a genetic risk factor for RA was introduced into the African American population through admixture, thus making these individuals more susceptible to subsequent environmental or unknown factors that trigger the disease.